The company is counted amidst the distinguished Manufacturers, Exporters and Suppliers of UV IR conveyor. The UV IR conveyor is designed with complete accuracy and precision by our expert team of engineers. 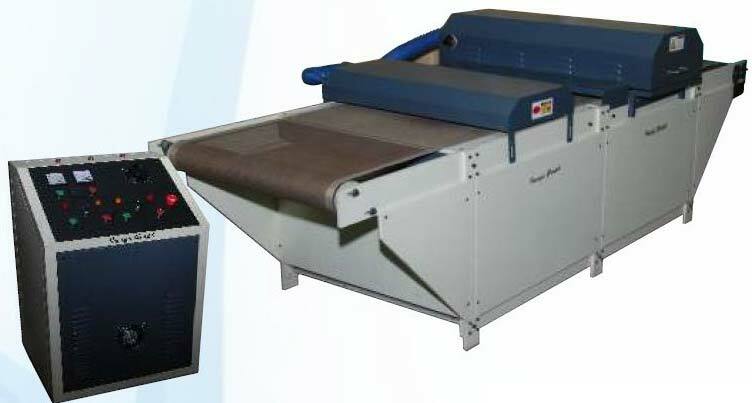 The UV IR conveyor offers reliable and efficient performance. We supply quality tested, durable and sturdy UV IR conveyor in various parts of the world at the industry leading prices. The use of UV Technology offers many advantages for all print process, including the ability to print on non-absorbent materials. The use of solvent free inks or varnish, immediate further processing and extremely high chemical and abrasion resistance. UV IR Systems is a cross chemical reaction when UV Varnish, Ink applied to object and it pass through under UV Light. It get cure instantly. UV IR Systems are available in different sizes and power. It can process through Sheet fed or web offset printing, Screen Printing, Letter Press, Flexo, Gravure, Varnishing or Roller coatings. It is suitable for Paper (Full & Spot), PVC profiles, Wood, Metal, Glass, Vinyl, Flex and So many other products.